Dar Habiba Location. 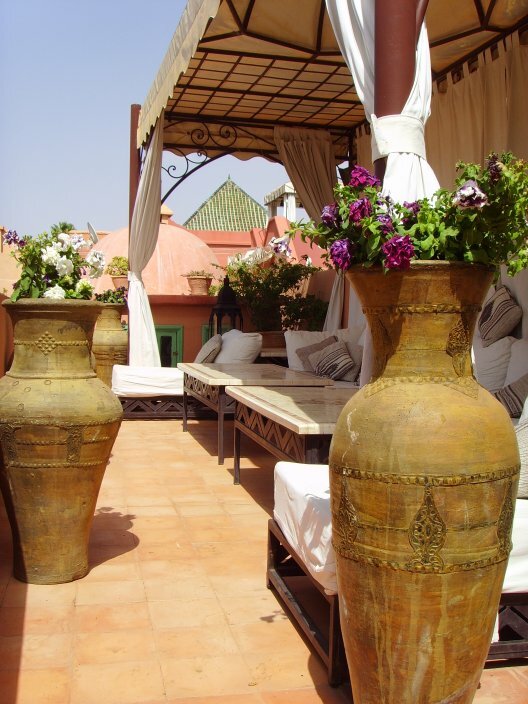 Book Dar Habiba Today with Hip Morocco - Holiday Accommodation in Marrakech, Morocco. 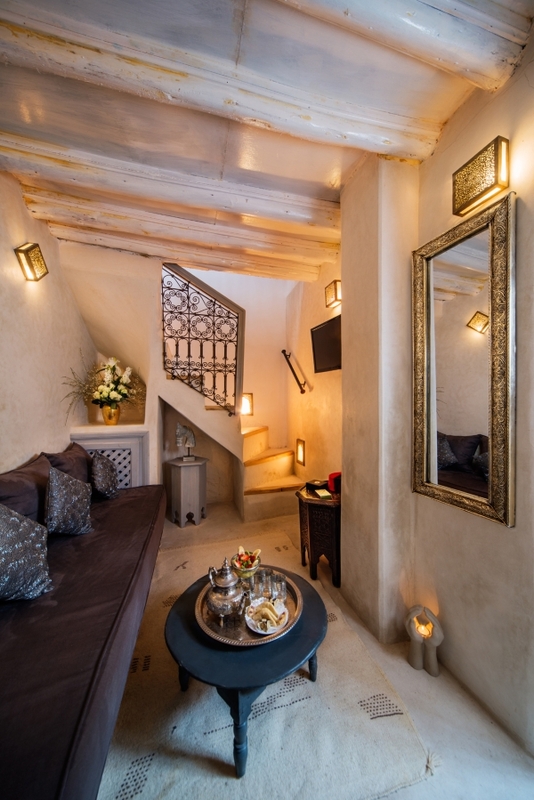 "Sleek, chic and very boutique...arrive as a guest and leave as a friend"
Dar Habiba - which translates as 'close friend' in Arabic - is a beautiful private riad set in the very heart of old Marrakech. 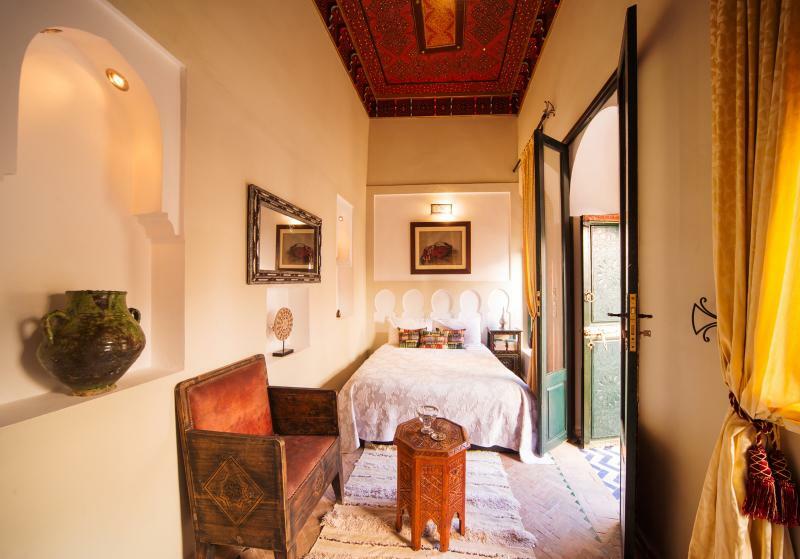 Once inside you will find a charming, traditional Riad that provides a safe and relaxing environment. 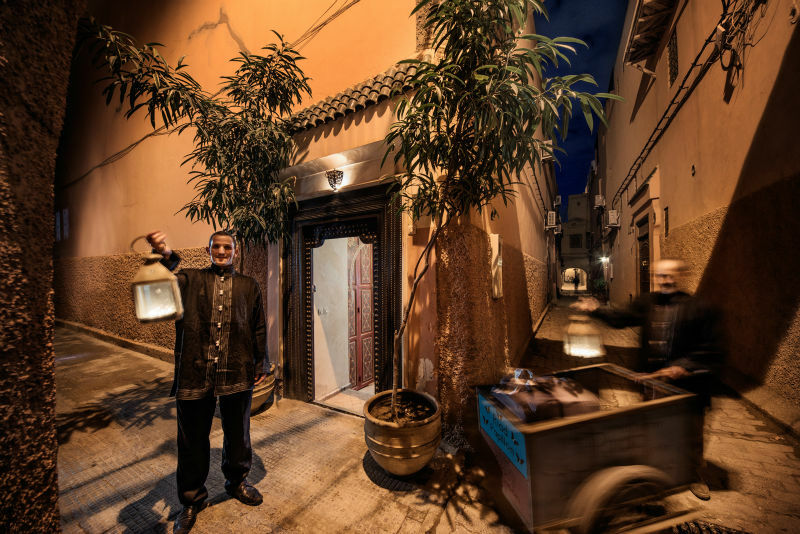 Habiba's reliable transfer service will bring you from the airport to the Riad where you be welcomed with mint tea and given a chance to familiarise yourself with the location and surrounding attractions. 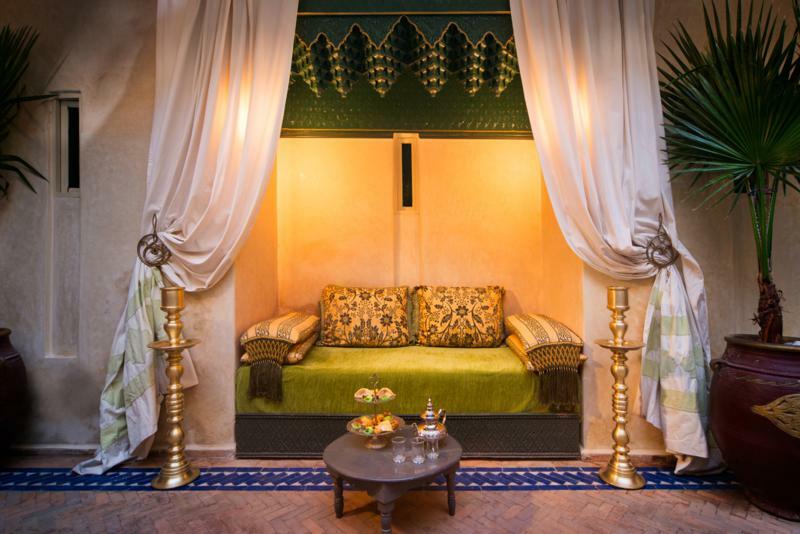 Guests typically love relaxing in our spacious courtyard, eating wonderful Moroccan food on the roof terrace and exploring the nearby palaces, souks and restaurants. Whatever your choices, the dedicated team at Dar Habiba are on hand to help make your stay in Marrakech a magical one. 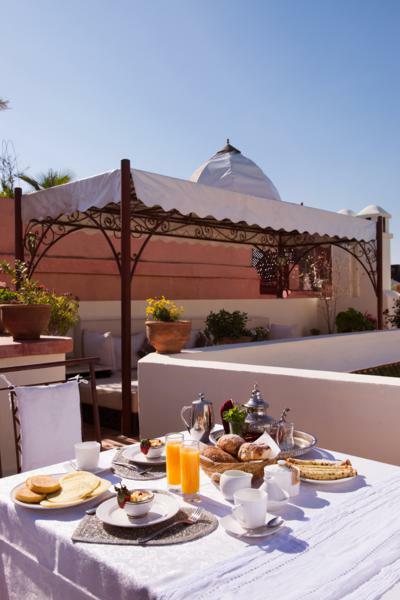 Breakfast:Is a typical Moroccan style continental breakfast. It is typically served between 8.30am and 10.30am each day, either on the Terrace or in the Courtyard. If you need it at a different time for any reason please let us know and we'll see what we can do. 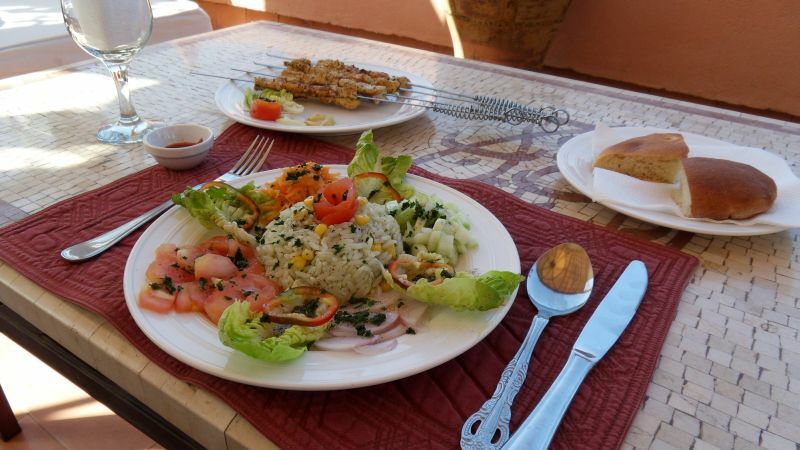 Lunch and Dinner: A menu of delicious Morrocan specialities is available for lunch and dinner. We would be delighted to prepare these for you, but please let us know the day before as the ingredients are bought fresh each day. With a manager from the desert town of Zagora who is truly passionate about Morocco and everything Moroccan. A beautiful costal 'blue city' only two and a half hours from Dar Habiba that is the source of Marrakech's beautiful fish supplies and has a rich history of trade of African produce. A long sloping beach populated by kite surfers, sunbathers and reflecting strollers from all around the world. As the gateway to the eastern deserts, Zagora is a quiet city with wonderfully hospitable people and nomadic men dressed in blue ('homme bleu') who come in and out of the desert on their lifelong travels. A short distance from Dar Habiba, the 7 waterfalls of Setti Fatma are a wonderful day trip from the vibrant Marrakech medina. The first 2 waterfalls are reachable within a couple of hours from the town and they get progressively further to the 7th as a full day trip starting at 9am and returning around 6pm. Thursday sees the streets around Bab El Khemis littered with peoples belongings and wonderfully diverse bric-a-brac that makes for a vibrant mornings shopping for everything you can imagine. "The location turned out to be perfect: wondrously close to the energy and charm of Jemaa el Fna, within a very easy stroll of taxi access, stalls, colour, food, noise, smells, shoes, jewels, cats, music lining the streets - and yet, the moment you set foot in the riad, it's steeped in peace and silence. 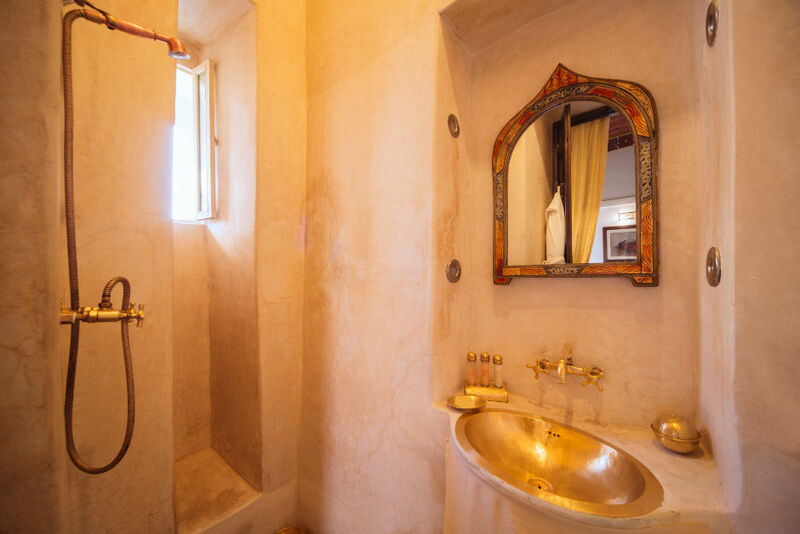 I learned that my room was originally a hammam, and the cosy little nook where the bed is just won me over completely... Next time I come back, I'd love to explore Riad Star and Riad Cinnamon, their other two properties. I'm sure they must be as unique and beautifully done as this one. 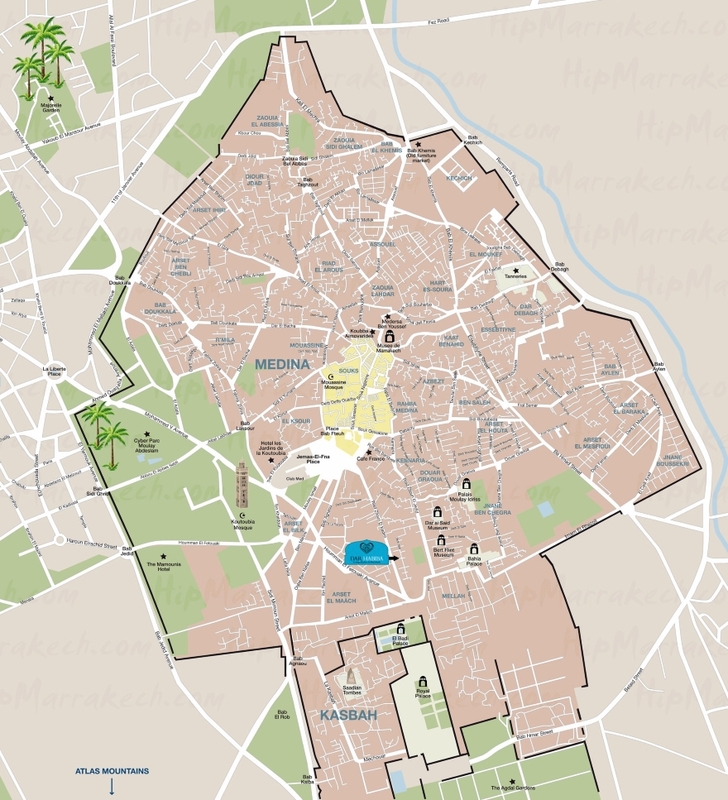 I booked through HipMarrakech.com, and they were dazzlingly efficient and accommodating - the whole process was seamlessly smooth, and I'd definitely recommend it. In fact, there's nothing about this place that I wouldn't recommend!" 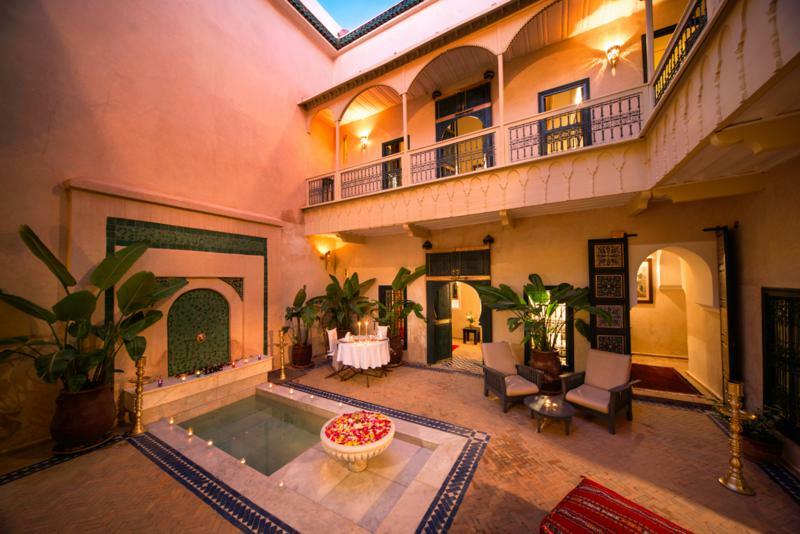 "This Riad was an absolute dream! The rooms are stunning with such fantastic attention to detail; spotlessly clean, all the necessary toiletries and more, the most comfortable beds and the best service we could have wished for! There are roses and candles everywhere which just add to the beautiful romance of the place - perfect for couples!" 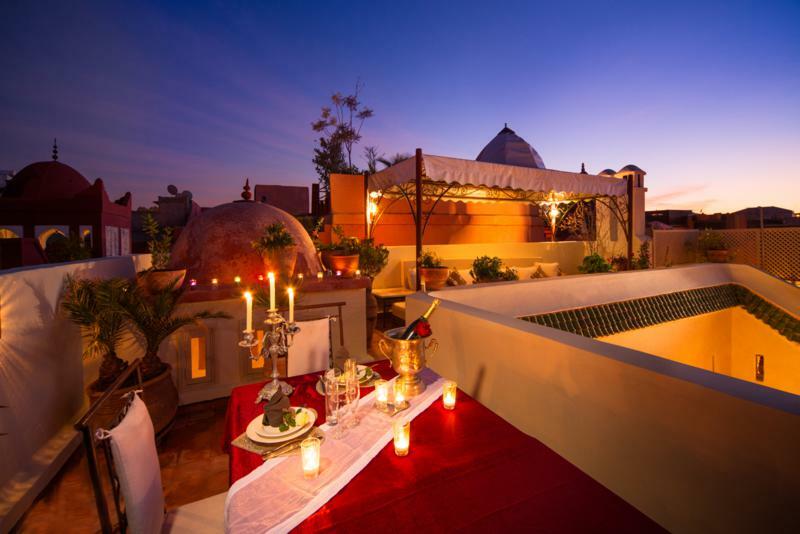 "Dar habiba was the perfect place to stay. 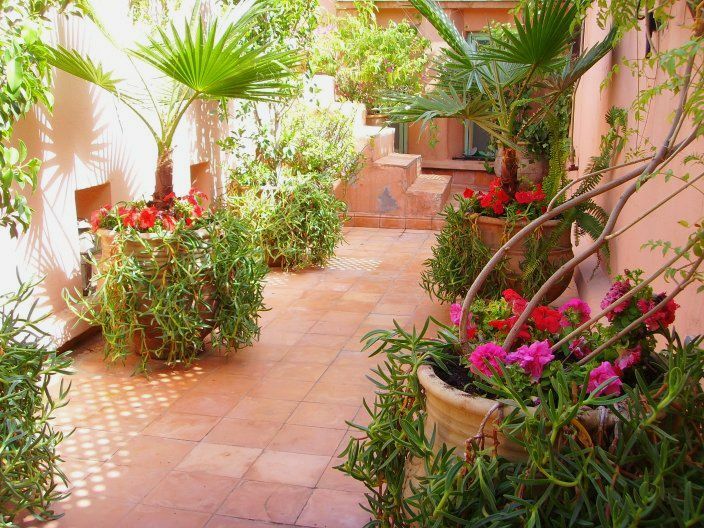 Hidden away within the back streets of the Medina yet only a short walk from the main square. It's a peaceful little hideaway and I could not fault it if I tried. I wont give too much away as I do not want to take away its magic but I would recommend it 100%. Our stay could not have been any more pleasant. We were looked after by Aziz who really could not have done anymore for us, he was there at our beck and call and was more than happy to answer our endless questions about Morocco! A truly great guy! We were given a phone with his number on which we could call if we were lost, the streets can be a little confusing and we did need to call him a couple of times to which he came and found us within minutes. The breakfast was great! On the last day we opted for eating dinner at the riad, one of the ladies made us a lovely chocolate cake for dessert. We also had the chance to meet Abdul, the manager of the riad who again did everything to ensure our stay was one to remember." 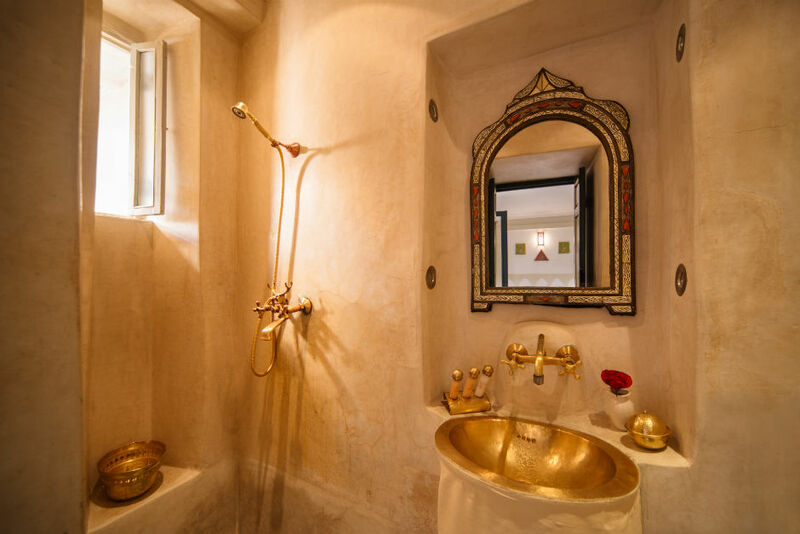 "Our experience with the hammam at Dar Habiba was perfect. The room is inviting and warm. The attendant was the BEST hammam attendant in our whole 3 week trip in Morocco (better than even the 5 star hotels). She had such an attention to detail and took such pride and care in her movements that she brought it to an art form. Thank you so much for our experience." 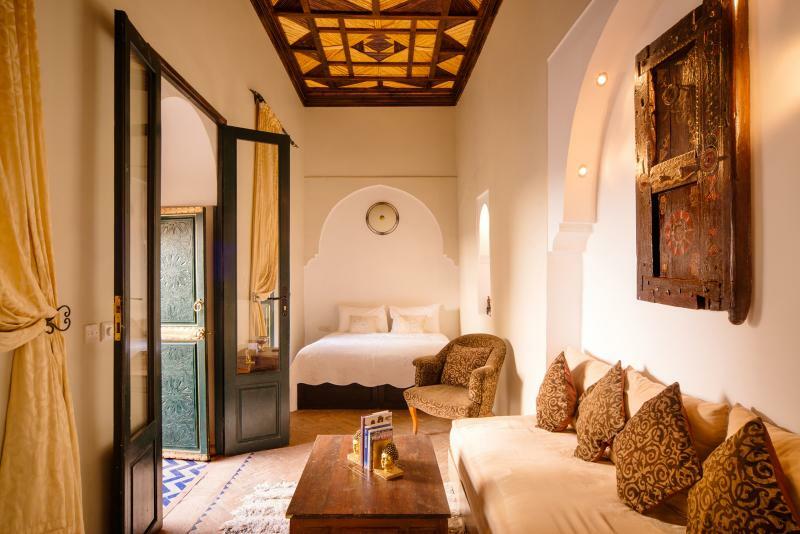 "Absolutely beautiful riad, with all of the western comforts subtly incorporated into a truly authentic Moroccan riad. Perfectly sized rooms with incredible ceilings, beautiful roof terrace, brilliant complementary breakfast with mint tea. The staff were incredible, offering us brilliant service and great advice about our time in the city. Couldn't fault it at all!" 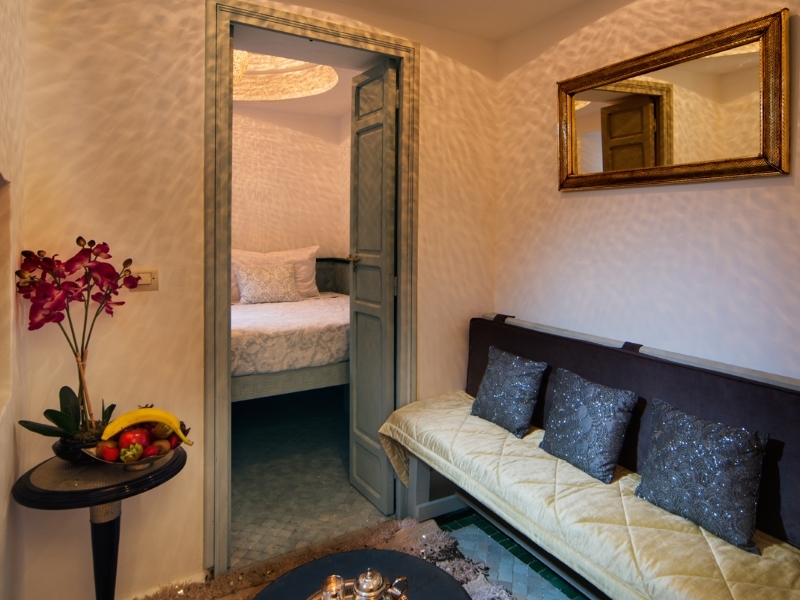 Dar Habiba is located in a quiet and exclusive district between Rue Riad Zitoun El Kedim and Rue Riad Zitoun El Jedid. Surrounded by other luxury Riads it is only a stone's throw (or two) from the beautiful Bahia and Baadi Palaces. It's hard to believe how tranquil it all is given it's only a few minutes walk from the tumultuous excitement of Place Jemaa El Fna in one direction, or great bars and restaurants such as the Kozy Bar and Le Tangier in the other. When arriving from the airport you'll be dropped off at the taxi rank at the end of Rue Riad Zitoun El Kedim, where there are usually plenty of porters to help transport your bags the rest of the way. Walking along Derb Jdid gives you no clue to the beautiful and mysterious interiors that hide behind the metre thick walls either side. 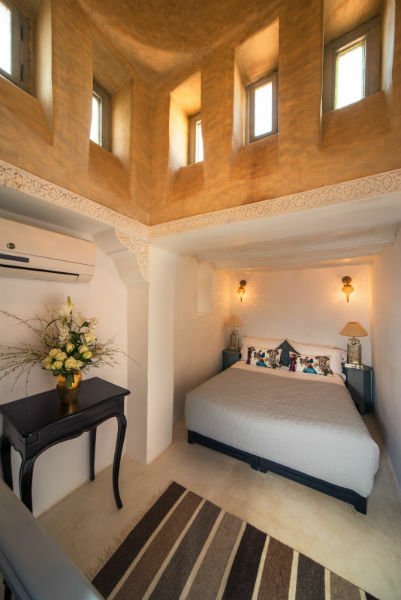 Two stunning coupola domes decorated with intricate plaster work and stunning hand crafted Fez style lamps complete the unique atmosphere. Room features: Air-conditioning, WiFi internet access, Satellite Tv, safe for personal effects, mini-bar, complimentary toiletries, bathrobes, hairdryer. 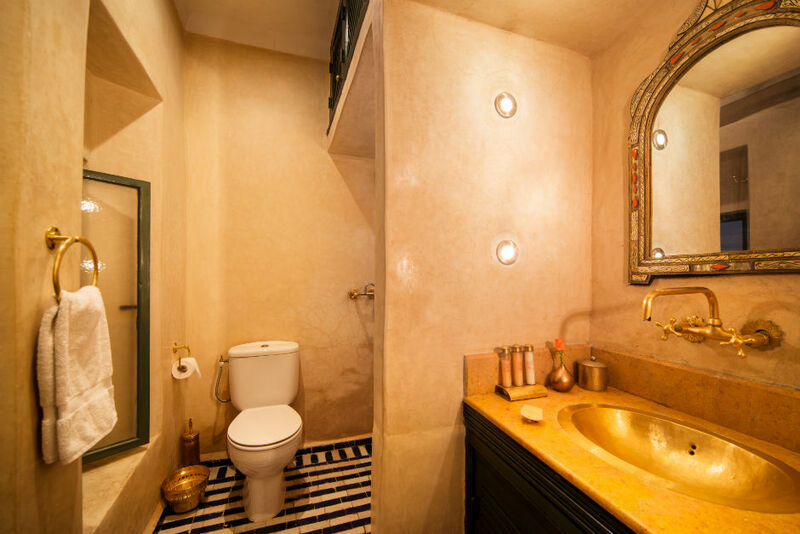 Contemporary Moroccan styling gives the Berber room a simple elegance and bright lively atmosphere. It is complete with an en-suite shower room, and is located off the beautiful courtyard. Room features: Air conditioning,Satellite TV, heating, Egyptian cotton linen, bathrobes, complimentary toiletries. 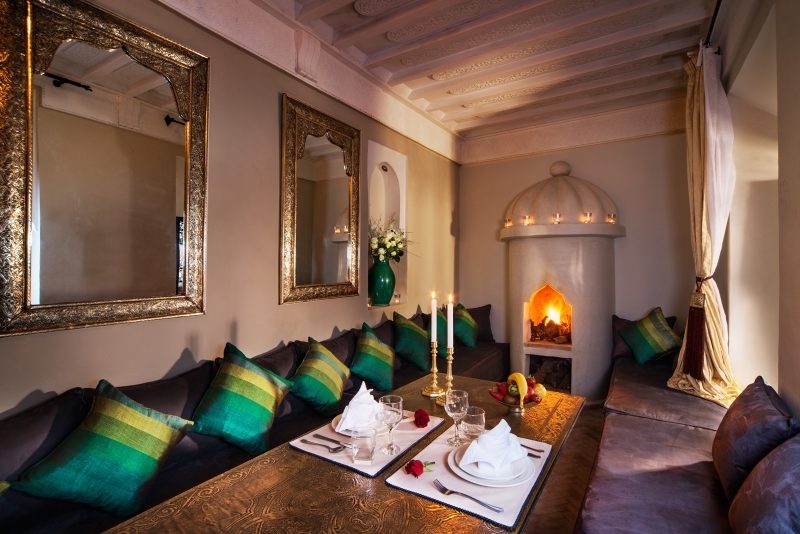 Contemporary Moroccan styling gives the Habiba room a simple elegance and bright lively atmosphere. It is complete with an en-suite shower room, and is located on the first floor. Room features: Air conditioning,Satellite TV, heating, Egyptian cotton linen, bathrobes,mini-bar, complimentary toiletries. Contemporary Moroccan styling gives the slightly larger Nomade room a simple elegance and bright lively atmosphere, with its high wooden ceiling giving it a more spacious feel. It is complete with an en-suite shower room, and is located on the first floor. Room features: Air conditioning, Satellite TV, mini-bar, heating, Egyptian cotton linen, bathrobes, complimentary toiletries. A charming mini suite brimming with character. 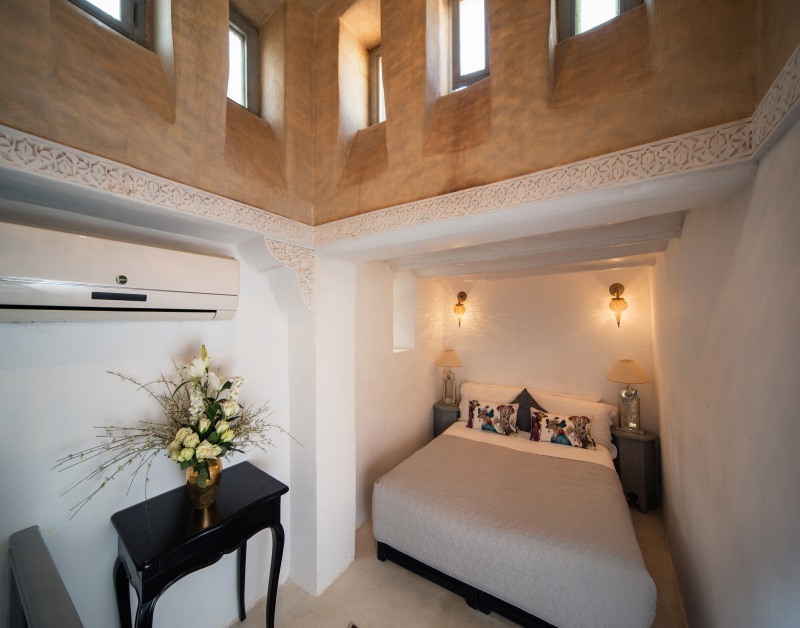 Enter into a cosy living space with sofa and satellite TV, to your left is the en suite shower room, to your right a quaint staircase that leads up to the sleeping area which features a stunning dome (in arabic Kouba) from which the room takes its name. Room features: Air-conditioning, Satellite TV, mini-bar, safe for personal effects, complimentary toiletries, bathrobes, hairdryer. 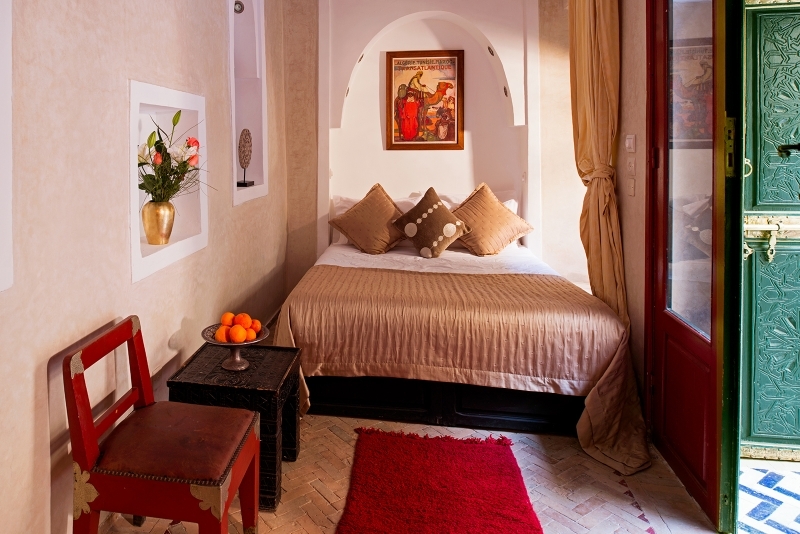 Contemporary Moroccan styling gives the spacious Koutoubia Suite a simple elegance and bright lively atmosphere. It is complete with a King size bed, seating area with sofa which can be turned into a single bed, and en-suite shower room. Room features: Air conditioning,Satellite TV, heating, mini-bar, Egyptian cotton linen, bathrobes, complimentary toiletries. 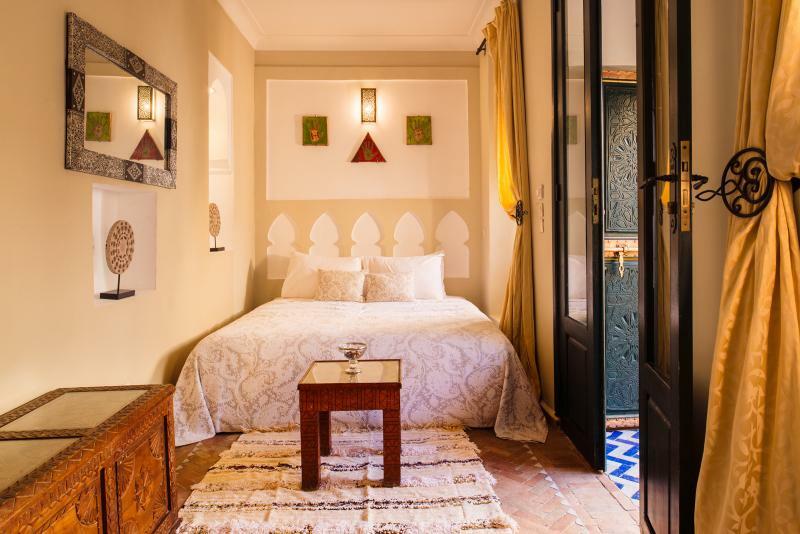 Whether it’s a special occasion, a relaxed family holiday or a last minute get-away with friends exclusive use of Dar Habiba woukd be a fantastic way to enjoy Marrakech. The base rate price at Dar Habiba is in pounds, euros, or Moroccan dirhams and exchange rates are approximate.